Life of a Knitphomaniac: It's COLD!!!!!!!!! I am running behind on my blog post....and I am going to blame it on the COLD! I live in mid/south Texas and we just do not get that cold here....well, it rained and sleeted on Thursday with freezing temps overnight, so the roads and highways were full of ice....when that happens, this city shuts down (with all the northerners laughing at us)....we had hundreds of wrecks and people in traffic for hours and I think just about all schools were cancelled. I did have to go to work, but I did go in late, I just was not going to chance hitting some ice and not know what to do (I did not learn how to drive on ice or snow). I have been doing lots in the knitting world.....I was able to block Paige's sweater, and she wore it to school on Saturday (I tell her I cut her face out of the picture, but she does not read my blog so don't tell her that I actually leave her beautiful face in the pic). Well, my greatest knitting friend Darlene was going to make her in the same color type, but in a solid called Buttersquash. Well, she saw my biker chick one, she and I both agreed that the pattern just screams for Varigated yarn.....so we checked out the Miss Babs website and found some Perfectly Wreckless colorway....so we ordered two skeins in the same order to save shipping......these two skeins could not be more different. It is like one was at the beginning of the dyeing process (bright and vibrant) and the other was towards the end (more soft and lighter). I have a picture of the two of them caked up side by side and they do not even look like the same colorway....so we are both going to make Hypernova's with this yarn.....so yes, I am crazy to make TWO Hypernova's and I am going to call them HyperCrazy (because I am crazy to try to do two). Oh, and the skein is so big, it wound around the bottom of my ball winder. Also, while we are on the subject of Stash Enhancements and Katahdin yarn....Darlene got me another skein of this yarn in the colorway Masquerade.....she got it for me as a birthday present, but she could not wait till my birthday to give it to me (I could not wait till her birthday to give her her gift either.....) It is gorgeous...I have no clue what I am going to make with it (but I am pretty sure it will not be a HyperCrazy)! Do you remember all those crochet bags I made a while back? Well, Darlene lined my last one for me and it looks AWESOME! Then as an added bonus, she used some left over material and made me a zipper bag to match it....I love it! I do have some sad knitting news...do you remember the pom pom blanket I made for Bizzle for Christmas? Well, she sent it home one day with the mother of a child that she babysits for....and that mother washed the blanket...not only did she wash it.....she washed it in HEAVY DUTY...it is nearly ruined...I am going to try to save some of it, but I am pretty sure it will be much smaller that before it met the washing machine. Switching topics back to the yarn clubs I joined for 2014....well, the Martina Behm First Package has shipped....it should be here this week. 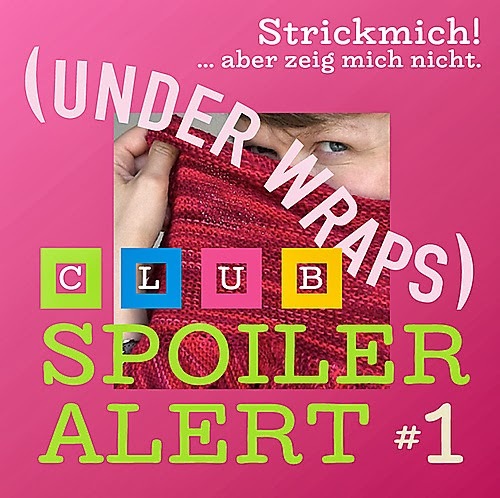 Here is a picture in the English Spoiler Thread, and I will insert the Project pic that shows Martina Wearing it (but it is hard to see what it is). I read that Canada already is receiving packages, so I hope it comes in this week!!!!! I am super excited.....I just hope this does not happen to my package...I placed an order online with a different company and FedEx says my package should be delivered in 1969 (before I was born)....ha, ha! 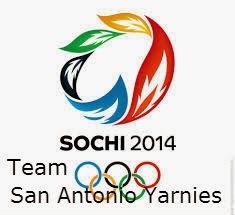 Oh....and I also got things rolling for the 2014 Ravellenics.....I will be captain of the Team San Antonio Yarnies. No requirement to live in SA....if you want to join, go right ahead...the more the merrier...more information here. Thankfully, I have 2 more weeks before that starts. Well, that is pretty much it for now...I had a lot of catching up to do...sorry if the blog is too long. Happy Happy Happy Knitting!! Stay warm! 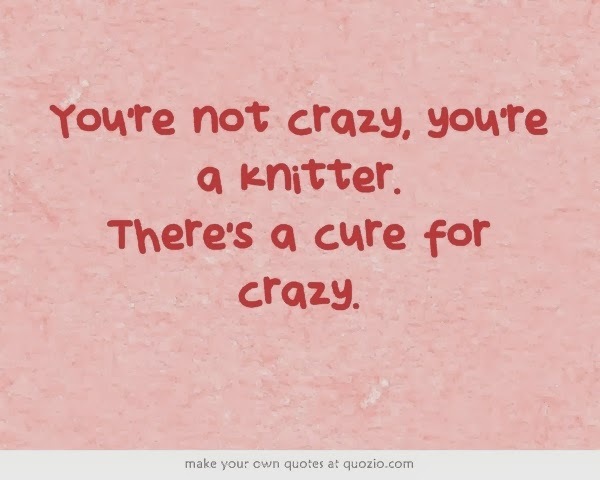 Carrie, there is not a cure for either of us and we are both knitters and we are both crazy. Am anxiously waiting for my Strickmich!Club to arrive as well. It was warm in Cozumel. Ruby, you are right that we are both crazy...and I should drag Darlene along into this category. I saw pictures of your cruise...it looked wonderful...I am (as always) jealous!